Well, now we come to the end of our early to mid-30s "true crime" drama series, "The Police Reporter". And we go out with a bang with "a story of gangsters, violence and bloodshed!" Program 26 looks at a series of payroll robberies that occurred in Chicago in 1920. A site on the mafia in America has some info on the real case. This previously uncirculated show was transferred from an original shellac Radio Release, Ltd transcription, pressed by Allied Recording in Hollywood, matrix number A-1127. 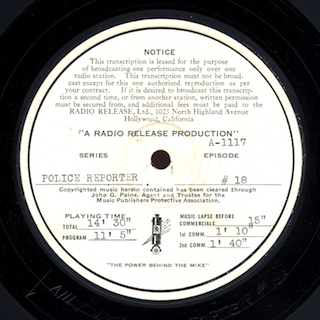 We're almost at the end of our run of the syndicated 1930s "true crime" drama series, "The Police Reporter". Program 26 is the next to last episode in the series and concerns the 1924 murder of John Nungesser by Emil Fricker in Highland, Illinois. A genealogy website has more on the real case. The show was digitized from an original shellac Radio Release, Ltd transcription, pressed by Allied Recording in Hollywood, matrix number A-1126. The side is dated 5/9/35 in pencil on the disc label. Program 24 of the syndicated true crime series, "The Police Reporter", looks at a 1930 case from Philadelphia. William Dansee is killed in a strange case of murder for hire ... and voodoo! You can read two original newspaper articles through ProQuest about the case from the Atlanta Constitution here and here. The show was transferred from an original shellac Radio Release, Ltd transcription, pressed by Allied Recording in Hollywood, matrix number A-1125. The disc is dated 5/7/35 in pencil on the disc label. This week's episode of "The Police Reporter", program 23 in the series, looks at the 1552 London case of Lord Charles Stourton who killed William Hartgill. You can read more about the real case on this Tudor website. 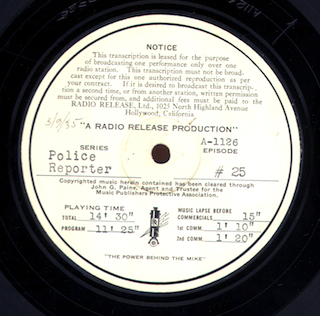 The show was digitized from an original shellac Radio Release, Ltd transcription, pressed by Allied Recording in Hollywood, matrix number A-1124. The show is previously uncirculated. We're only a few weeks away from the end of our 1930s syndicated "true crime" drama, "The Police Reporter". We're up to program 22 of twenty-six shows in the series. This week, we hear an unusual case from Budapest where a man wants to sell his insurance policy back to the company that sold it to him, setting off a strange plan to collect on the policy. The shows in this previously lost series have been transferred direct from the original shellack Radio Release, Ltd. transcription discs pressed by Allied Recording in Hollywood. The matrix number for program 22 is A-1123. 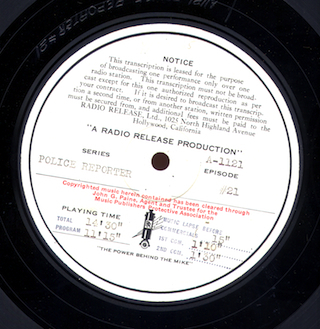 "The Police Reporter", our quarter-hour true crime drama series from the early or mid-thirties returns this week with program 21 in the series. From Edinburgh, Scotland in 1827, we hear a grisly story, kicked off when a teacher of surgery is approached by two men selling a corpse. It's the true story of the Burke and Hare murders. 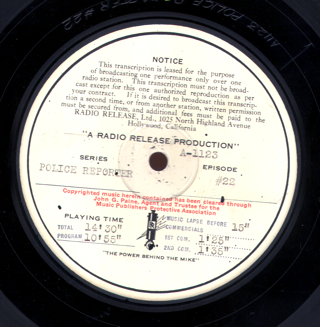 The episode was digitized from an original shellac Radio Release, Ltd transcription pressed by Allied Recording in Hollywood, matrix number A-1121. Our early 30's syndicated "true crime" drama continues this week with episode 20 of "The Police Reporter". In France in 1874, a love triangle between a young man, a woman and her daughter results in murder. The show was digitized from an original shellac Radio Release, Ltd transcription pressed by Allied Recording in Hollywood, matrix number A-1122. You'll hear a skip at the end of the show in the theme song - it's not a flaw of the disc, but is in the original recording. Program 19 in our early 30s syndicated "true crime" quarter-hour series, "The Police Reporter" deals with the strange murder of Tom Gorman, a case involving mistaken identity and a barking dog. As usual, the show has been digitized from an original shellack Radio release, Ltd. transcription pressed by Allied Recording in Hollywood. The matrix number is A-1119. A grisly murder with body parts found all around Brooklyn. Is this some "CSI" drama on tv this week? No, it's program 18 of "The Police Reporter", our little quarter hour "true crime" drama syndicated in the early 1930s. This week's episode looks at the 1931 murder of a speakeasy owner Andrew Zabitsky. It's pretty hot stuff for the early 30s - speakeasy owners were the drug dealers of the time, involved in all manner of organized crime and shady dealings. The show comes direct to digital from an original shellac Radio Release, Ltd transcription, matrix number A-1117, pressed by Allied Recording in Hollywood. Hope you're enjoying our little quarter hour of gruesome true crime in "The Police Reporter". Program 17 looks at the 1928 New York case of Henry S. Gaw who was murdered by "Texas" Jim Baker in the Guggenheim Brothers Chemical Laboratory. There's an announcement at the end of the show inviting listeners to write in to their local station if they enjoy the program. I was able to dig up some vintage material on this particular case - an article from the Rock Hill (South Carolina) Herald from December 28, 1928, an LA Times story from the same date, and another from the NY Times. The show was digitized from an original shellac Radio Release, Ltd transcription pressed by Allied Recording in Hollywood, matrix number A-1120. The show is previously uncirculated.